Dinner is cooking, my Moxi tells me it’s overheating, and Time Warner Cable tells me I’m experiencing a hold time of upwards of thirty minutes, but please be assured it’ll be handled as quickly as possible. Okay, I haven’t looked it up yet, because it’s important to wonder, right? The logo is some kind of lime-looking thing sipping a beverage. So I figured this was a company that sold icees or something like that. 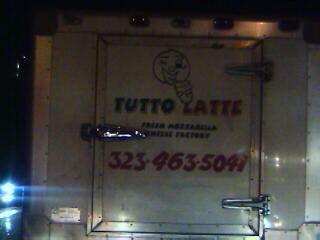 But it’s called Tutto Latte. Okay, still a beverage company, and maybe the little lime likes coffee. Can’t blame him. So, what’s with the sipping lime? Maybe it’s a little block of mozzarella cheese, and he’s gluging some really fresh milk. But then… where did the hand come from? Is it his hand? Is someone making him slurp… his own insides? And if it’s a fresh cheese factory, then why would they want an icon of someone drinking anything? Why not a happy cow or a happy Italian cow? So one of the words means “milk,” and I don’t know what “Tutto” means (“Fresh?”), and they’re a fresh cheese factory so… yes, I guess it’s a hunk of cheese sipping on some milk. Since I’m going to be on hold for the rest of my life, feel free to discuss why limes love cheese. “Tutto” means “all.” Like tutto mare (“all of hte see”) or tutti frutti (“all fruits”). I can’t really see that pic all that well, so I’m not sure what precisely is going on with the citrus and the drinking and the dairy, but I can help on the language front. Ha! I just actually typed “all of hte see” for “all of the sea.” Can you tell my brain is glazed over from election results? I’m voting for the “all milk” theory. No fillers, etc. It looks like a moon and not a lime to me. Pamie, I love your brain. I think it’s actually a disembodied head or something… And a disembodied hand to go with it.Which, when you think of it, is sort of gross. Another vote for the moon here. Maybe because the moon is allegedly made of cheese? Although that just raises the same troubling issues as it being a ball of mozzarella. FYI- I had the same problem with my moxie box- after a couple of hours of having it on (whether or not I was watching TV) it would give a message every couple of minutes that it was in iminent danger of shutting down from over heating. This went on for a couple of months, and I’d have to unplug it whenever I wasn’t watching TV. Turns out I just needed to wipe off the cover of the cooling fan on the back (you don’t need to open the box up, just wipe off the back). I have had no problems with it since I did that a few months ago. However, it is nice to know that I am not the only person this has happened to. Heather, you probably just diagnosed the problem. It’s a daily battle with cat hair around here. Thanks. I’ll give it a shot. What most of us are forgetting is that Mozzarella usually comes in balls. You know, the stuff you actually get from a place that makes cheese, and not the stuff that you find after it’s been processed one of 300,000 ways into blocks and chunks and shreds at the grocery store.So it’s probably a ball of mozzerella drinking whole milk, since that’s what tutto latte means… ;)Ah, what’s this clueless male doing introducing logic here anyway?